Torre Agbar in Barcelona is one of the most featured building in Barcelona. It is not a monument, but everyone has heard of AGBAR Tower and everyone makes her photographs. It is very famous, but 15 years ago the Torre Agbar was not there. We can see his curious way since 2003 (although not completed until mid-2005). The Torre Agbar is a symbol of contemporary Barcelona. 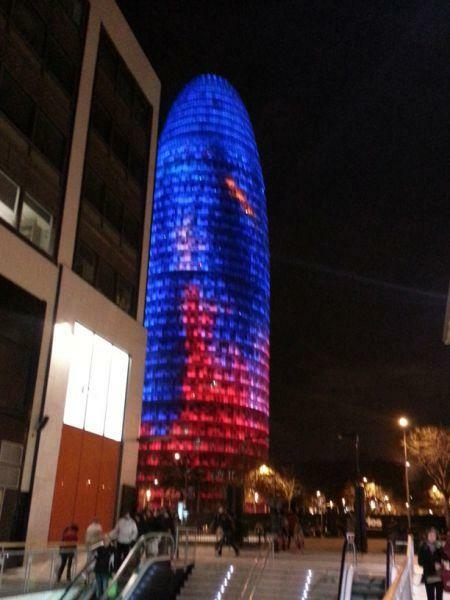 The glass surface of the Agbar Tower reflects the colors of the Mediterranean sea. The design of this geyser shaped building was designed by the French architect Jean Nouvel. The Agbar Tower is 144 meters high and until very recently was the headquarters of Agbar (Aguas de Barcelona) , but was recently purchased by an international group to convert the building into a luxury hotel in the coming years . The inspiration for Nouvel to design the Agbar Tower. Jean Nouvel said to have been inspired in Gaudí reference to the bell towers of the Sagrada Familia. In addition , as a tribute to the Sagrada Familia , the north-facing side of the tower was designed with the intention of obtaining an optimal panoramic view of the unfinished work of Gaudí. Montserrat mountain also inspired Jean Nouvel. Thus, the Agbar Tower has the shape resembling any of the tips of Catalunya ‘s most famous mountain. Nouvel said his intention was to make the shape of skyscrapers emerge from the ground in a special way and to be a tower dedicated to being the headquarters of a company related to water services supported on the metaphor of a geyser sprouting from the deep sea. Next Next post: How to get to Montserrat?